Pop tarts, everyone knows about them, but the ingredients you find in them can be extremely harmful to your health. Not only are they filled with artificial junk, but they are loaded with carbohydrates and sugar. So would you believe us when we said it was possible to enjoy pop tarts while maintaining a ketogenic state? Well, it’s true. But not any old pop tarts. These keto almond butter pop tarts with coconut butter icing are the perfect way to indulge in your favorite childhood treat without the stress of going over your carb count. So what are the contents that make up these glorious goodies? The ingredients include ¾ a cup of almond flour, ⅓ a cup of coconut flour, 2 eggs, 6 tablespoons of butter, 2 ounces of melted all natural almond butter, ½ a cup of melted coconut butter and you can even top them off with a hint of cinnamon for a little extra kick. All of these ingredients and one serving still only comes to less than 5 grams of net carbs. These pop tarts are lacking carbs but are filled to the max with healthy fats. One of the more abundant ingredients in this recipe stems from almonds — almond flour and even the almond butter, too. Almond flour is one of the best keto friendly, low carb flour alternatives out there today. Almond flour is naturally abundant in vitamin E, a key antioxidant that helps protect the body from free radicals and the potential damage they could cause. This low carb flour substitute is also a rich source of magnesium. Magnesium plays a role in many different biological functions. For example, it helps maintain healthy blood sugar levels, helps to reduce insulin resistance and has even been shown to help reduce blood sugar[*]. It may seem like there’s a lot of steps to this recipe, but it’s worth it. 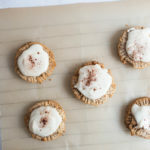 If you’re tired of making the same keto treats and want to experiment something new, these Keto Pop Tarts are a great way to keep things interesting and fun. In a large bowl, combine the almond flour and coconut flour. Cut the butter into small squares and add it to the dry ingredients. Press the butter into the flour using two forks until it’s mixed as best you can. In a separate bowl, beat the eggs with a hand mixer on high and then pour it into the flour to mix. Blend by hand until you get a dough-like consistency. Ball it together with your hands and wrap it tightly with cling wrap. Store in the fridge or freezer for about an hour. While that chills, prepare the almond butter. Melt it slightly. After about 30 minutes, preheat the oven to 350 degrees Fahrenheit. Roll the dough between two pieces of parchment paper. Cut out circles of the dough using the top of a cup (should have a total of 12 circles to make 6 pop tarts). Place 6 circles on a baking sheet lined with parchment paper. Take a tablespoon of the melted almond butter and dab a little on each circle of dough. Cover the circles with a second layer of dough. Take a fork and going along the edges of the circles, gently press down to create a seal between the two pieces. Place in the oven to bake for 20 minutes (or until the edges become golden brown). While waiting for the pop tarts to bake, melt the coconut butter. Once the pop tarts are done, take them out and dab the melted coconut butter evenly on top of all 6 of the treats. Does Taking MCT Oil Stop Fat Loss? Here Are The FactsFact or Fiction: Does Taking Exogenous Ketones Stop Fat Loss?